The three rappers from the suburbs of Hamburg got together in 1992, following the breakup of the hip hop band Poets of Peeze. By late 1993, the Hamburg label Yo Mama was ready to accept German language rap music as a commercially viable product, and the trio headed into the studio. The band's breakthrough occurred quickly with singles off their first album, Auf einem Auge blöd: first their tribute to the Low German dilect of Northern Germany, "Nordisch By Nature" and then "Jein". After the success of their second album, Außen Top Hits, Innen Geschmack, in 1996 as is so often the case for underground bands that become commercially successful, the band's ties to the underground hip hop scene dissolved. While this made the band members feel isolated from their roots, they also took the opportunity to explore new musical styles and develop new strengths, which they incorpoated into their third LP Fettes Brot lässt grüßen in 1998. Their next productions built and expanded upon these strengths. Their 2005 album Am Wasser gebaut marked a shift away from rap to a pop-style tinged with rhythm and blues and Latino influences. The change was well received by fans and seems to have won them some new adherents. The album has brought Fettes Brot their biggest chart success yet. The first single "Emanuela" made it to number three and spent several weeks in the Top Ten, breaking all the bands previous records for a single. The LP, too, made it further into the Top Ten list (currently at number 4) and for longer (currently 4 weeks) than any previous album. 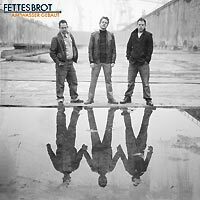 A year before the release of their 2005 album, Fettes Brot established their own music label: Fettes Brot Schallplatten (Records). The band characterizes their record firm, tongue-in-cheek, as a "limited liability company for the purpose of self-exploitation." Whether they will continue to outdo themselves remains to be seen.